FLEXspace – The Flexible Learning Environments eXchange – is a community and a robust collection of learning space examples contributed by academic institutions and industry partners from around the world. 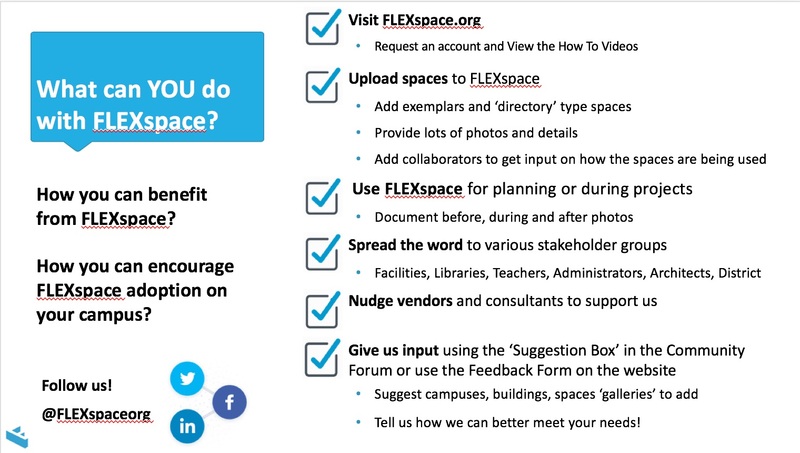 By logging into the FLEXspace portal, you’ll be able to search and contribute to a collection of detailed learning space examples, tools and resources, idea boards, and a community discussion forum. Search & filter all spaces or browse curated galleries of learning space examples and resources hand-picked by the FLEXspace editorial teams. See What’s New in FLEXspace 2.0. Learn more about what you can today and coming soon. Request an Account or Sign In to start using the FLEXspace portal today! Help us grow and thrive! Spread the word! Invite others to join!